Juliette Yardley has a wee on the side of a Welsh mountain - and on the top, and again on the way down! - . Juliette Yardley has a wee on the side of a Welsh mountain - and on the top, and again on the way down! A close friend of mine suggested a while ago that we did something a bit different. 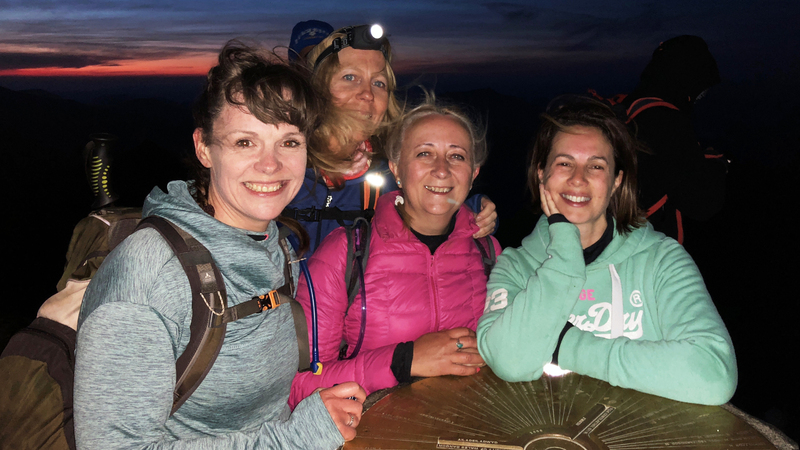 “How do you fancy climbing Mount Snowden in the middle of the night to watch the sun rise from the summit on the summer solstice?” she asked. It seemed a good idea in the middle of winter when we booked it. Last weekend, me and my pals hired a beautiful cottage in North Wales for the weekend that looked out onto the mountain in the distance. Each time I looked at it I got a little nervous, as did my pals. Even in the light it looked like a big challenge, I could only imagine what the climb would be like in the dark. But it gave me a great opportunity to put my Laughology tools into practice, and they were called upon many times. Growth mindset helped me overcome my doubts and as we started the ascent I encouraged the group to flip our words around and concentrate on positive language. I focussed on grit, determination and perseverance. One foot in front of the other, one step at a time, keep on going. We knew that it would be hard work, but we focussed on getting there. We developed a group mantra (it had a few too many rude words to share I’m afraid). It helped spur us on and reminded me of all the times I’ve asked primary school children to develop a mantra to stay positive and motivated for their SATs. We smiled a lot and power-posed before we set off, and during the climb. We shared stories, we laughed a lot and needed a wee a lot too (why do these mountains not have toilets neatly in situ). I had to improvise. We all came out of our comfort zones. Being able to appreciate mother nature in all her glory was simply breath-taking. With the surrounding mountains, the village below, the stars above and my friends by my side, it was a very memorable challenge. Watching the sun rise at the end of the climb was a special moment (the miniature bottle of Jack Daniels also helped). So, was it worth it? Of course it was. Setting a challenge, coming out of your comfort zone and pushing yourself gives you a great sense of achievement and confidence. It just goes to show that Laughology isn’t just for your working life, it’s for every part of your life and gives brilliant added value. Juliette’s father was a real-life Caractacus Potts, who used to wake his children up in the mornings using a homemade intercom strung together with wires, switches and tin cans. Juliette once delivered a full day’s training with her dress on back to front, which highly amused her audience who delighted in not telling her.